Blood removed from the mattress, unquestionably the blood of the victim, was grouped and found to be devoid of A and B factors. The blood was readily soluble in distilled water, and agglutination after treatment with anti-serum and cells was immediate compared with controls of anti-serum and cells alone. The same results were found with a second and rather large spot (1/2" diameter) from the same door panel as the very large spot in this photo. There was no sign of delayed agglutination, and solubility of the blood was excellent. Grouping of the large spot was performed simultaneously with the same sera and cells and in identical manner. Several differences were immediately apparent: the blood from the very large spot was definitely less soluble than that from the smaller sport or from controls from the mattress. In running the agglutination tests, in every instance and with tests for both A and B factors, agglutination was much slower and less certain than the controls. The fact that delayed agglutination occurred indicated clearly that this blood was also O group, but its behavior was so different as to be striking. 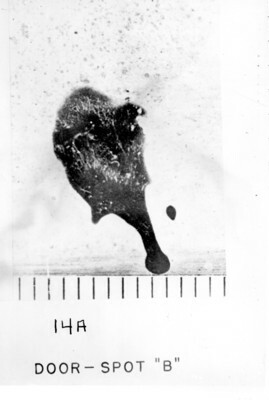 These differences are considered to constitute confirmatory evidence that the blood of the large spot had a different individual origin from most of the blood in the bedroom.